After Stanley’s departure in February 1872, Livingstone kept a selection of his pocket-books (I to XIII, plus one from a previous expedition) in a box at Ujiji, an Arab depot on the eastern shore of Lake Tanganyika. These pocket-books pre-dated Stanley’s arrival and served as back-ups for the Unyanyembe Journal, which Livingstone had entrusted to Stanley. The pocket-books remained at Ujiji after Livingstone’s death in March 1873 and were recovered by the British explorer Verney Lovett Cameron in February 1874 (Cameron 1877a,1:240-41). 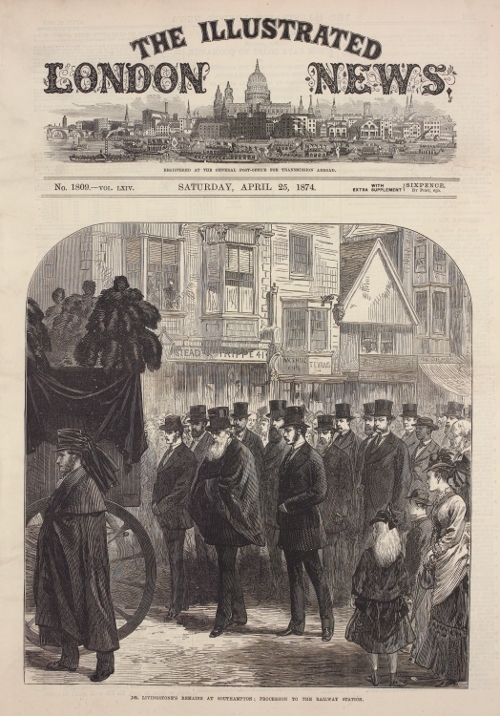 Cameron sent the pocket-books back to England, where Horace Waller, Livingstone’s friend and posthumous editor, received them on behalf of the Livingstone family in January 1875. Ultimately, Waller used the "Unyanyembe Journal" (1866-72) and the four pocket-books Livingstone filled during and after his time with Stanley as the primary sources for the Last Journals (1874), but the initial thirteen pocket-books arrived too late to be of use to Waller (Helly 1987:64-65, 130). Curiously, Livingstone did not leave the Manyema Diary in the box at Ujiji when he embarked on his final journey, although the diary – like the pocket-books left at Ujiji – predated the Stanley meeting and duplicated material in the Unyanyembe Journal. Rather, Livingstone took the diary with him, and it was in his "battered tin travelling-case" when he died. Eventually, this diary along with "the field diaries dating from Stanley’s departure in March 1872 to Livingstone’s last entry in April 1873" accompanied Livingstone’s body back to England (Waller, in Livingstone 1874,1:v; Helly 1987:65). Livingstone’s decision to take the Manyema Diary with him ensured that it was available – unlike the thirteen pocket-books that preceded it – to Waller when producing the Last Journals. In fact, the Last Journals includes a facsimile by Cooper Hodson of 297b/117 of the Manyema Diary (Livingstone 1874,2:opposite 114; learn more about the facsimile). Waller’s introduction also details Livingstone’s method for producing the diary: "for pocket-books gave out at last, and old newspapers, yellow with African damp, were sewn together, and his notes were written across the type with a substitute for ink made from the juice of a tree" (Waller in Livingstone 1874,1:iv). Yet these claims must be qualified and clarified. Although the references to "old newspapers, yellow with African damp," "the Standard newspaper," and the "decoction used instead of ink" point primarily to the Nyangwe portion of the 1871 Field Diary, Waller indeed had the entire Manyema Diary available to him. Agnes Livingstone transcribed the first two-thirds of the diary – the Bambarre Field Diary (Clendennen 1979:276-77, Field Diaries 35 and 37) and the first half of the first page of the 1871 Field Diary (1871a:297c/102) – while C.A. 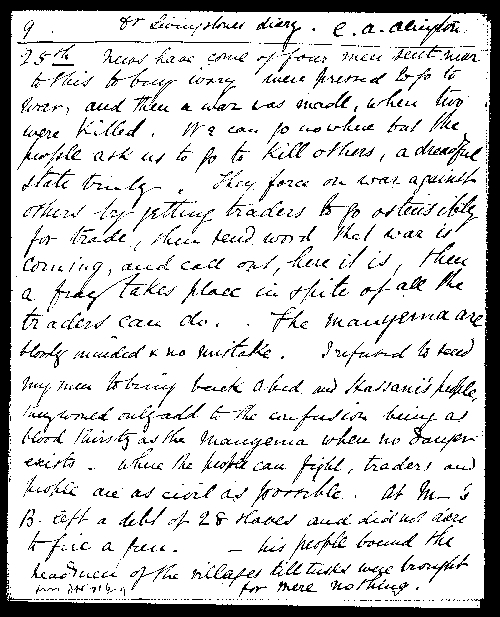 Alington transcribed the first third of the 1871 Field Diary (1871a:297c/102-123). These transcriptions, although faulty and incomplete, were then typeset and, after much revision, became the basis of the Last Journals. 1871 Field Diary. The page corresponds to a portion of 297c/113. Courtesy of the Rhodes House Library, Oxford University. Both Agnes Livingstone’s and a portion of C.A. Alington’s transcriptions survive and are held among the Waller Papers at the Bodleian Library of Commonwealth and African Studies at Rhodes House, Oxford University (Mss. Afr. s. 16/6), as are both the original and revised versions of the typeset transcriptions (Waller Papers, Mss. Afr. s. 16/6-8 passim). The relationship of the first two-thirds of the Manyema Diary to Agnes’s transcription and, ultimately, to the 1874 published text will be examined in a separate critical edition to be published by the Livingstone Spectral Imaging Project in 2013. Comparison of the original 1871 Field Diary, Alington’s transcription, the 1872 Journal, and the published Last Journals shows that, despite assertions to the contrary, Waller used only the first third of the 1871 Field Diary (i.e., that part transcribed by Alington) for the final text; then the 1872 Journal to cover the rest of Livingstone’s time in Nyangwe. In other words, after the last diary entry transcribed by Alington, 30 April 1871, the text of the Last Journals makes a radical departure from the text the 1871 Field Diary, and there is no evidence to suggest that the last two-thirds of the 1871 Field Diary were ever transcribed before the current critical edition.